In the ‘a divided dot’ project, Marlena Kudlicka has carried out a detailed analysis of the Point, focusing on the situations in which it could be divided. 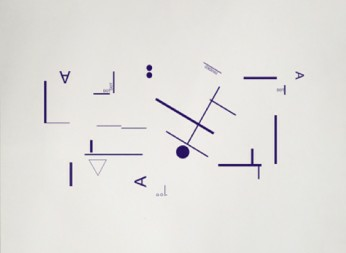 For the ‘a divided dot’ phrase, she has designed a diagram where the arrangement of lines and divisions as well as the letter shapes have been turned into an assembly of three-dimensional forms. The rectangular outline of the external walls of the museum hall constitutes a book cover enclosing blocks built of walls and cuboid– like glass cases, while the spatial blocks form the book’s letters. A Typographic Point was the reference as it is the basic unit of measure used for measuring font size and other typographical elements.